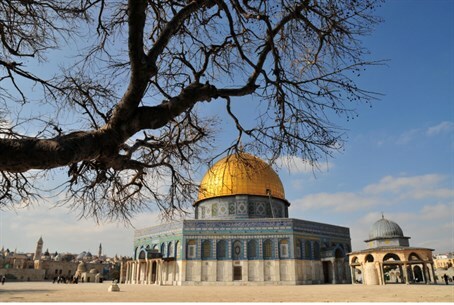 In final installment of 3-part series on the Temple Mount, we take a look at a lesser-known aspect of the history of the Dome of the Rock. This article is the third and final installment in a series exploring the "status quo" on Jerusalem's Temple Mount. For Part One click here; for Part Two click here. Parts I and II of this series have shown that the "status quo" on the Temple Mount is not quite all it's been hyped up to be. It certainly is not an all-out ban on Jewish prayer on the holiest site to the Jewish People – because for hundreds of years, up until possibly 300 years ago, it was frequently used for just that purpose. Jews visited the Mount often and prayed there regularly. On the other hand, if the "status quo" refers to the arrangements put in place after the Six Day War in 1967, they have long been changed – and to the detriment of Jewish rights there. It is ostensibly illogical to demand retaining the "status quo" to forbid Jewish prayer on the Temple Mount, while changing the "status quo" in order to much more severely restrict Jewish visitation rights. In any event, latest research regarding the construction of the Dome of the Rock – the magnificent structure that stands atop the site of the Holy of Holies – shows that it was originally built not for Muslims at all. Rather, it was built for the Jewish People! "The Al-Aksa Mosque [at the southern end of the Mount, opposite the Dome of the Rock – HF] was built as a Muslim house of prayer outside the boundaries of the original Temple Mount, and therefore it points southward towards Mecca. And at the request of the Jews, Omar built the Dome of the Rock sanctuary to serve as a house of prayer for the Jews. This was after the Jews showed him the site where the Holy Temple had stood – and it does not point to Mecca." Rabbi Goren clearly delineates between the two buildings: One is in the direction of the holy Muslim city of Mecca, and is to serve as a mosque – while the other was built without regard to Mecca, and only at the guidance and request of the Jews. "In this year [635 C.E. ], Omar began to restore the Temple at Jerusalem, for the building, in truth, no longer then stood firmly founded, but had fallen to ruin. Now when Omar inquired the cause, the Jews answered saying, 'Unless thou throw down the Cross, which stands on the Mt. of Olives, the building of the Temple will never be firmly founded.' Thereupon Omar threw down the Cross at that place, in order that the building (of the Temple) might be made firm…"
Le Strange underlines the trustworthiness of this amazing report by emphasizing that the author, Theophanes, preceded the earliest Arab authorities on this topic by more than 50 years. He further highlights that Theophanes lived "considerably under a century and a half [after] the date of Omar's conquest of Jerusalem." It is thus to be seen, based on apparently the earliest account of the building of the Dome of the Rock, that it was built not for Moslems, but for Jews, and was even supposed to be a "more firmly founded" version of the Holy Temple. How ironic it is that this is the true background of the building that now symbolizes, throughout the world, Moslem control of Judaism's holiest site – and the ban on Jewish prayer there. When next is heard a call to return to the "status quo" on the Temple Mount, let it be clear that this means nothing less than full Jewish prayer rights at the holy site – and possibly even much more.